Vacation rental duplex. Sleeps 6, 2.5 bedrooms, 2.5 bathrooms. Dogs allowed. 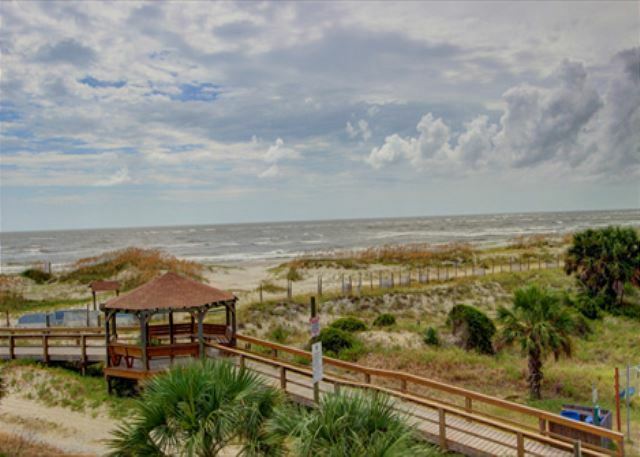 Beautifully furnished beach house on Tybee Island just steps away from the ocean. 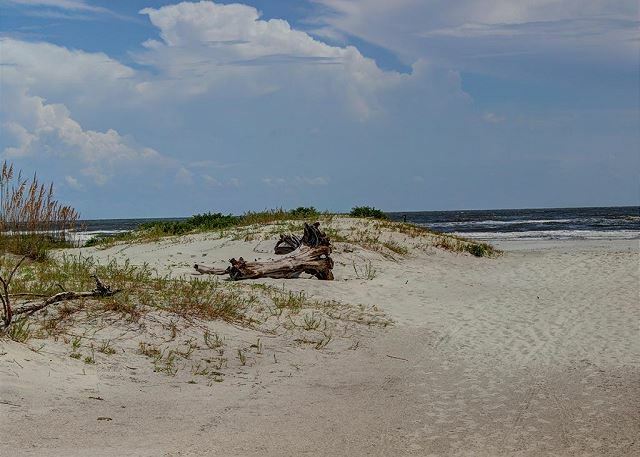 Located at the south end of Tybee Island, this home is ideal for those looking to truly relax and enjoy peace and quiet, but is still within walking distance of local shops, restaurants, and the Tybee Pier. The first floor features a large living room, with floor to ceiling windows that open up to a deck overlooking the ocean. Fully-furnished kitchen with breakfast bar and sky light. The second story has two bedrooms and two baths. The master bedroom has a private porch and ocean views, and the second bedroom has twin beds. Amenities include off-street parking, outdoor shower, grill, pull out couch, and high speed Internet. The cottage was beautifully done in the view was spectacular. Furnishings were comfortable and the atmosphere was very relaxing. It was well furnished. My only suggestion would be to put instructions on how to use the televisions. We never figured that out but we didn’t need television anyway. It was a lovely short vacation and we would definitely return. Thank you so much Laurie for your review. We do hope you book with us again soon one day. The best thing about this rental is the location and the views. It was a nice place to stay however it is in need of some minor updates, some of the furniture was a little worn. We enjoyed our trip very much and no more time then we spent in the rental it was a good choice. Thank you so very much for the review. We do hope you will come back soon. Great views from both decks. Very relaxing and peaceful. Place was very clean and well stocked. Thank you Cindy for the kind review. We are so happy that you enjoyed your stay at the Beach House and hope that you visit again soon! It was nice. The home was clean, spacious and right on the beach. However, we were disappointed there were no beach towels or chairs for the beach. We had to rent both. There was only enough laundry detergent for one load. That was inconvenient. Otherwise, nice place and we would stay there again. Thank you Lynn for your review. We are happy that you enjoyed your stay at the beach. The issue you were disappointed in have been reviewed and taken care of. We hope that you will book again with us so that we can have a second chance to give you a flawless stay!! Perfect location- steps from the beach. Great views from decks. Comfortable and clean home. Note: the home is a duplex, the rental is the right side in the picture. The home is plenty spacious for a family of 4. No one was in the other unit when we were there - it was very quiet - as was the beach. It was almost as if we had a private beach. But this end of the island is where all of the kite surfing action is - beautiful to watch. Property mgmt very responsive and great communication. Thank you so much Sara for your nice review of your stay at the beach house. We do hope that you will return again soon! Overall highly recommended. Some updates needed but clean. Excellent view and access to beach. Thank you so much Mathew for the kind review. We do hope that you will stay with us again on your next trip! Thank you Wanda for your review. We took care of the issues mentioned and hope that you will return again on your next visit!! The beach house was exactly as advertised; there were no unwelcome surprises. 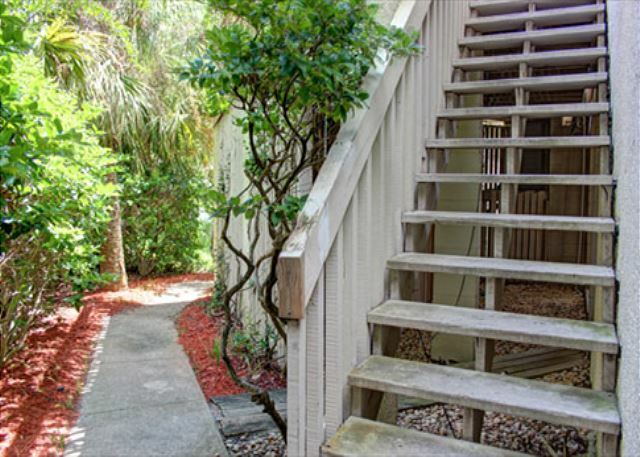 I was very satisfied with the house's proximity to the beach; it is only a few steps away! The views are great: the beach is clearly visible from both the lower deck and the upper balcony. You can hear the surf from the house, which is wonderfully relaxing. Another big selling point is the house's adjacency to downtown Tybee. All the shops and restaurants are only blocks away, so when you've had enough sun and sand, you can go for a nice walk, grab a bite, and maybe a souvenir. I would definitely recommend this property to friends and family!